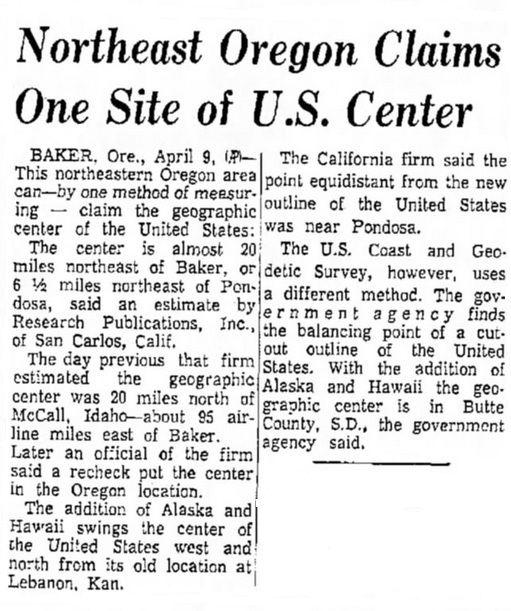 The designation at Pondosa, Oregon, for being at the geographical center of the United States on April 7, 1959, just one day after McCall, Idaho had inadvertently been named for the center. After Hawaii was added as the fiftieth state, two men from San Carlos, California, took it upon themselves to determine the new geographical center. William O. Holmes, president, and B. J. Holmes, vice-president, of Research Publications, Inc., made their own determination that a location approximately 25 miles north of McCall would be the new location. Then the following day, they changed their mind and said it was closest to Pondosa, Oregon. This news came despite a press release that had been made by the Department of Commerce several weeks earlier on March 18, 1959, announcing that the new geographical center location was north of Belle Fourche, South Dakota. The exact position by latitude/longitude is somewhat uncertain, but a newspaper article from the Herald and News in Klamath Falls, Oregon, nearly a year later on March 1, 1960, stated that Holmes had calculated a box for a possible area. 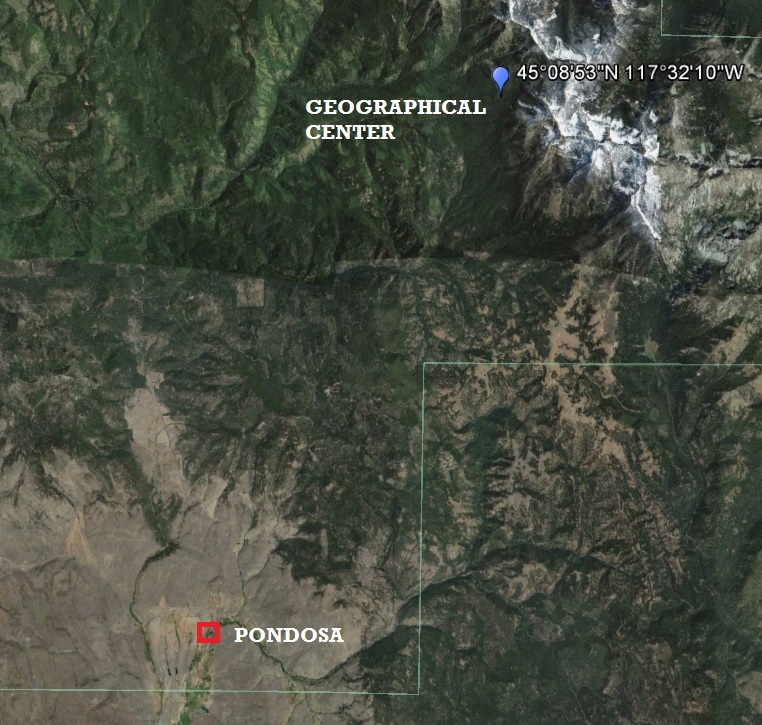 The center of this box was 45�'53"N / 117�'10"W. This location was said to be 11 miles northeast of Pondosa. The nearest landmarks from this location is southeast 1.00 miles to Burger Butte and 1.40 miles northeast to China Cap. The saw mill at Pondosa was established in 1925 and had once boasted a population of 250 residents. The new designation at Pondosa came too late. In March of 1959, the Valsetz Lumber Company closed the sawmill due to increased competition and dwindling timber supplies. 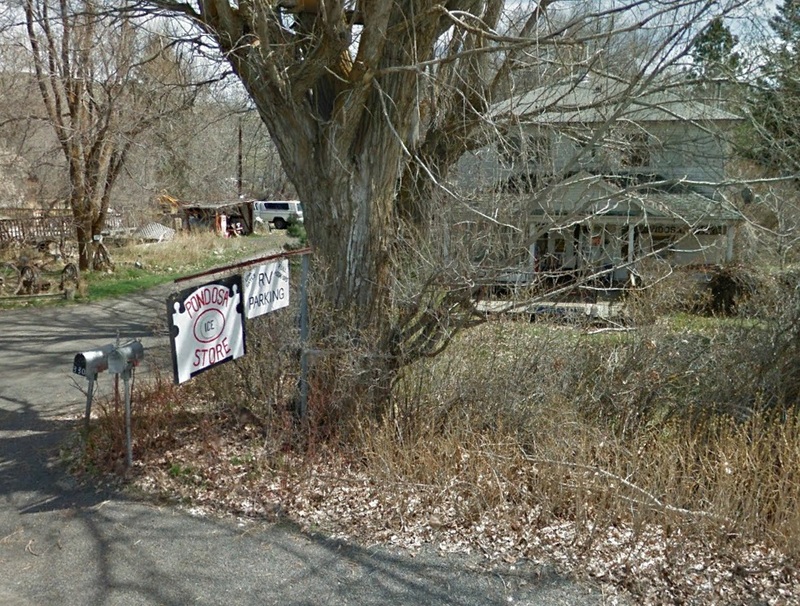 On May 5, 1959, the lumber company held a public auction to sell the entire town. The valuation was set at $2.1 million, but at the close of the sale only $33,925 was brought in. The property was sold as individual units which included a saw mill, 10 industrial buildings, a general store, a hotel, 53 homes and 280 acres of land. 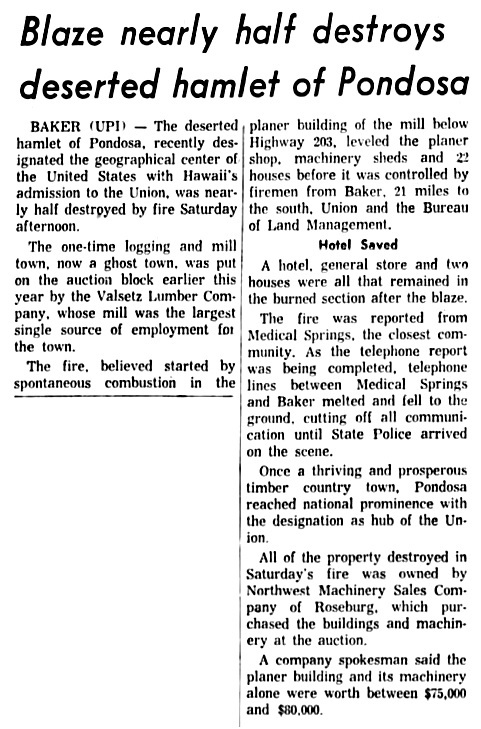 In one further blow to the town, a fire in mid June of 1959 had started by what was believed to be spontaneous combustion in the planer building which ultimately destroyed that building, several machinery sheds, and 22 houses. Today the general store still exists off Highway 203. 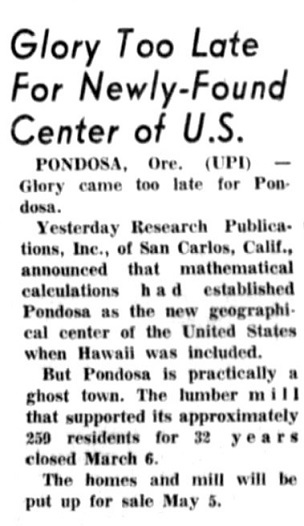 Despite the town never really being given a chance to have its claim to fame at being at the Geographical Center of the United States, local residents are still aware that Pondosa had once been given that distinction. 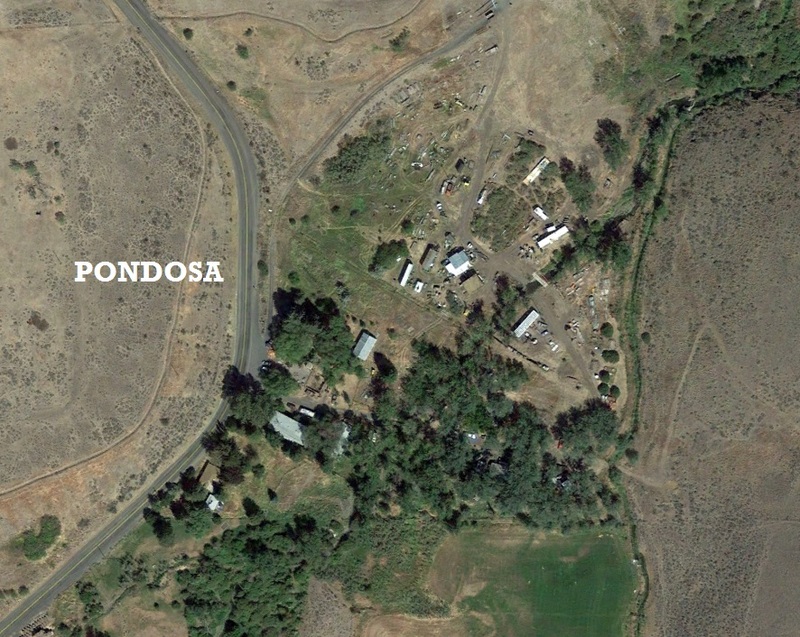 Aerial image showing the Geographical Center location 11 miles northeast of Pondosa. 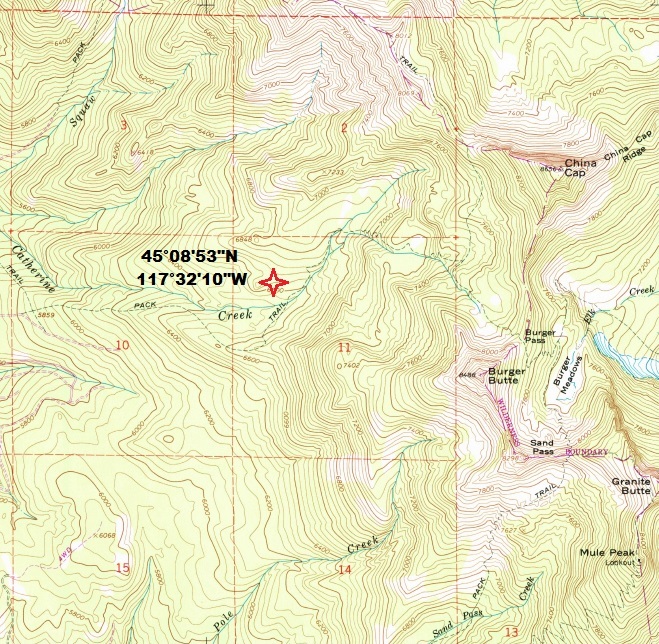 The calculated location in relationship to nearby China Cap and Burger Butte peaks. U. S. Geological Survey 7.5-minute quad sheet "China Cap 1965 (1984)". The remaining buildings at the once thriving town. Google Earth Street View. 4/2012. Fairbanks Daily News-Miner. April 9, 1959. San Berardino County Sun. April 9, 1959. Bend Bulletin. June 22, 1959. 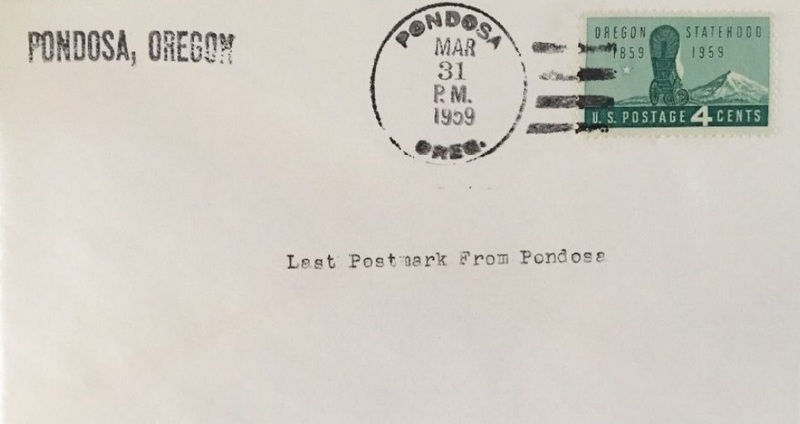 The last postal cancellation from Pondosa on March 31, 1959. Ruth Hessey was postmaster.